Bar maybe cotton buds/cotton wool – this is the most basic beauty item you can have pretty much. And boy is it a good-un. Is it glam? No. Is it’s fancy? No. Is it worth braving Primark for? Yes. Well – anywhere that sells face cloths/flannels is fine – I just like these because they’re a bargain. A flannel is something I associated with being a kid and refusing to get out of bed – my mum would say ‘I’ll come and get you with a cold flannel’ and I’d be out of bed like a shot. I don’t actually recall her ever needing to go as far as actually get me in my warm cosy bed with a cold, wet flannel… which is good. But the idea alone was enough to wake me. But the reason I like these is that they’re much more thorough/effective than a muslin cloth and really do help gently exfoliate and remove any cleanser residue at the same time. I personally like the white ones, but in hindsight – past a wash or two they tend to start to look a bit grey. So I might resort to going for a coloured one next time I stock up. At a couple of quid for a set there’s nothing not to like though – get yourself down Primark and stock up pronto. A very handy addition to a skincare routine – simple, but makes a difference! 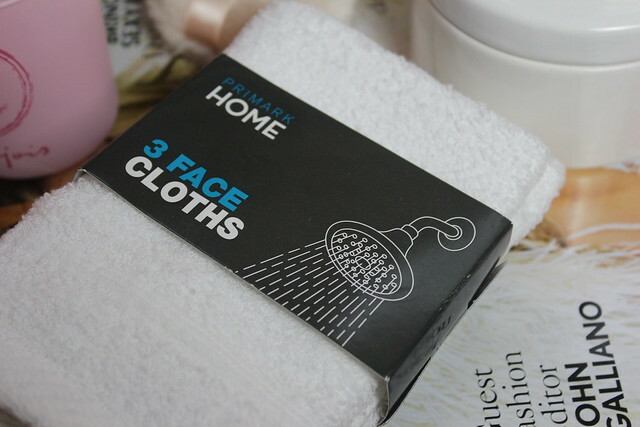 I have bought their premium ones and they are great too, they wash really well, especially for the price of them, I think they were 3 for £5.00 – Bargain! I love opening a fresh new face cloth and tend to throw them away after about a month (I know – sooo bad for environment :/) but the primark ones would be so much more cost effective than the other brands I use!